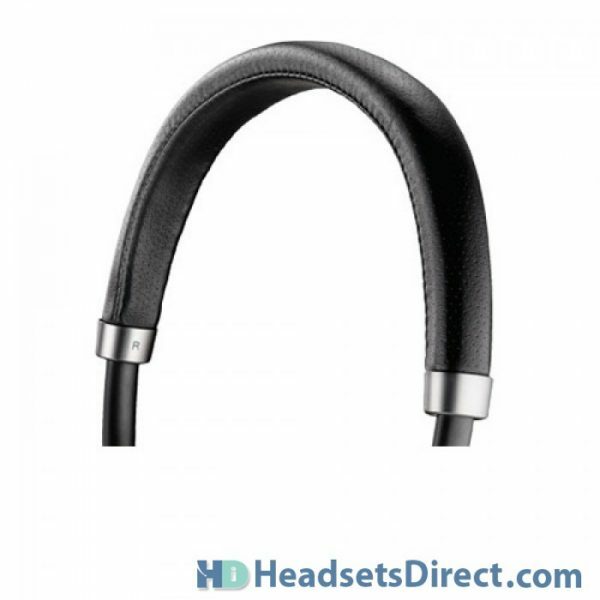 Plantronics Blackwire C725 Headset - Headsets Direct, Inc. 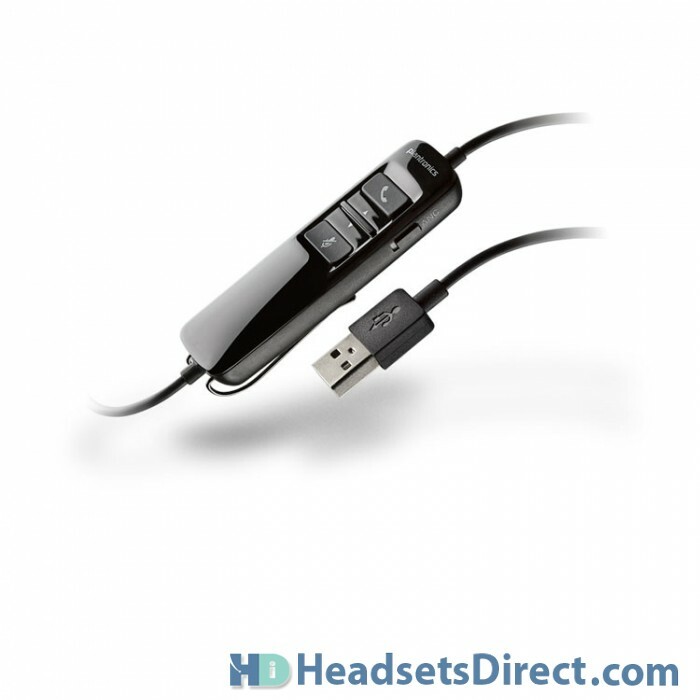 The Blackwire 725 USB headset helps you tune out distracting noises so you can tune in to your work. 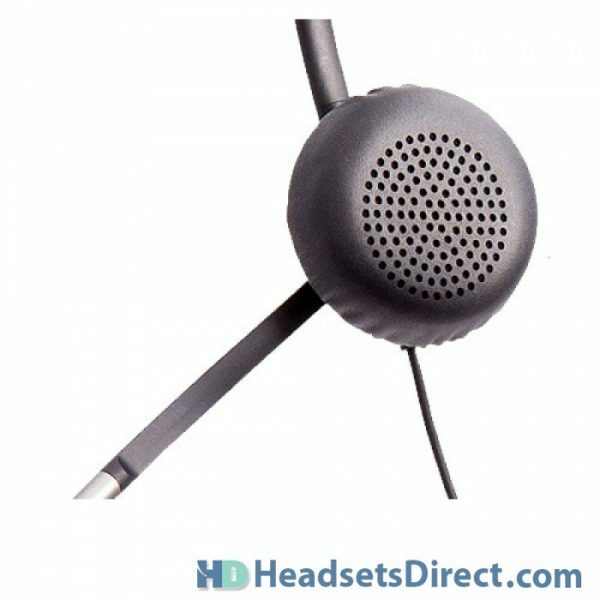 It features Active Noise Canceling (ANC) technology to minimize distracting external sounds, along with a noise-canceling mic that ensures that your voice is heard crystal clear on the other end. Along with PC-based calls, it’s great for listening to music and multimedia in high-fi stereo. 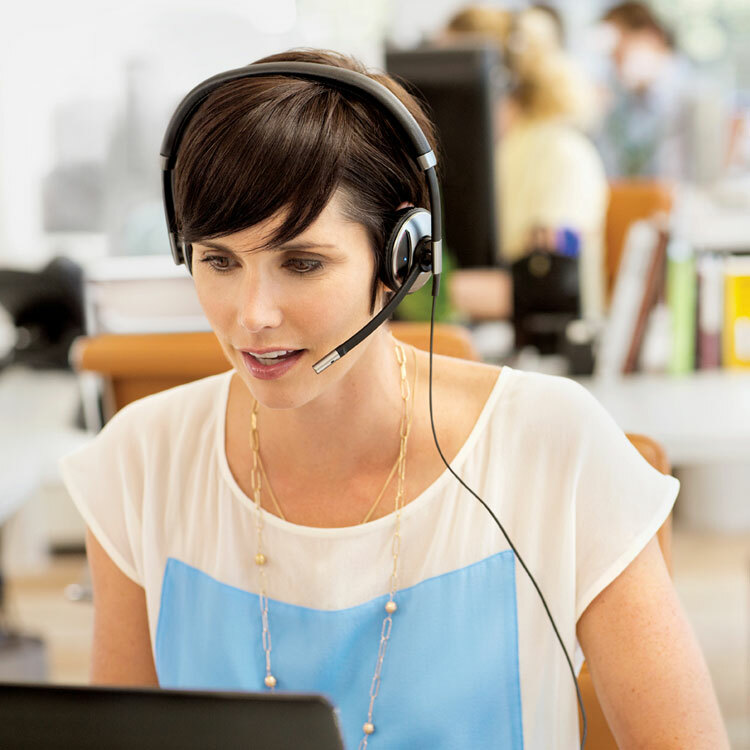 Smart sensor technology lets you answer a call by simply putting the headset on. 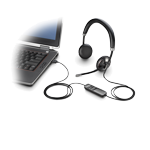 Use the intuitive inline controls for answering/ending calls, adjusting volume, and muting. Plus folding ear cushions and a carrying case make it easy to take on the go. With the Blackwire 725, keep the focus on work — and distractions at bay. 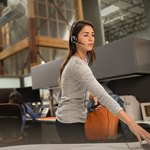 Experience industry-first Smart Sensor™ technology that lets you answer a call by simply putting on the Plantronics Blackwire C725 headset, making it the most productive and versatile “corded” headset on the market. 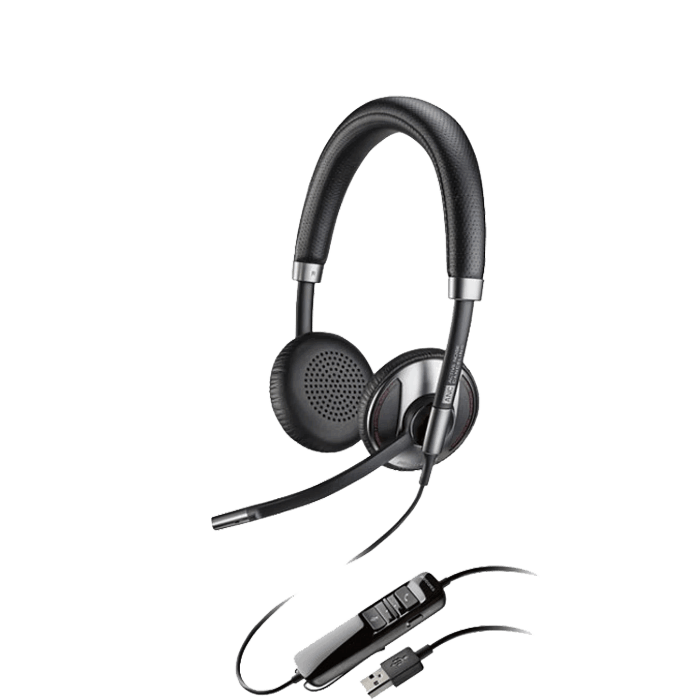 Offering PC wideband, noise-canceling microphone, and hi-fi stereo sound, the Blackwire 725 provides a truly outstanding audio experience – making it ideal for conference calls, webinars, listening to music, and watching videos with dynamic hi-fi stereo sound. Wideband audio and Digital Signal Processing mean incoming calls are crystal clear — and so is your voice, thanks to the noise-canceling mic. The Dynamic EQ feature optimizes your voice quality when on calls and automatically adjusts the EQ settings when you’re listening to music or multi-media. 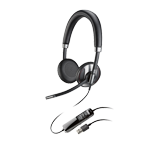 With the Plantronics C725, you get the latest Active Noise Canceling (ANC) technology that reverses surrounding sound waves to cancel low frequency noise in order to isolate and minimize ambient noise, providing truly immersive audio that allows you to focus on what matters. Close out the noise, stay in the zone. 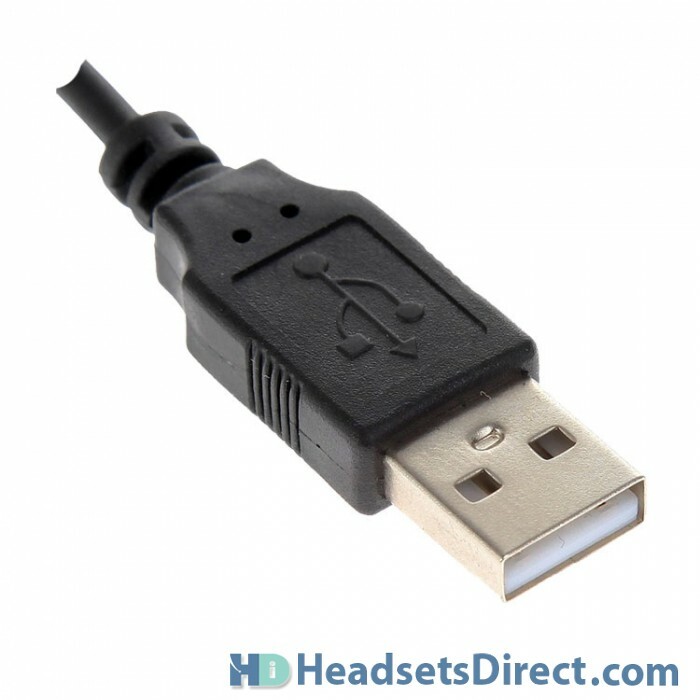 This a great headset as it is comfortable for long periods of use, however I’ve had a couple of instances where my ear gets shocked by the headset, and not like just a small discharge, like to the point i have to remove the headset and got a headache one time from it. HDI: With any issue like this, we ask that you immediately contact Plantronics at 800-544-4660 for assistance and replacements. Love them… I’m buying more sets for my people. I have always had a good experience with this product. This is a nice headset – it’s comfortable for long periods of wear, and it seems to work well as both a recording device (for creating online tutorials) and as a telephone headset for VOIP. 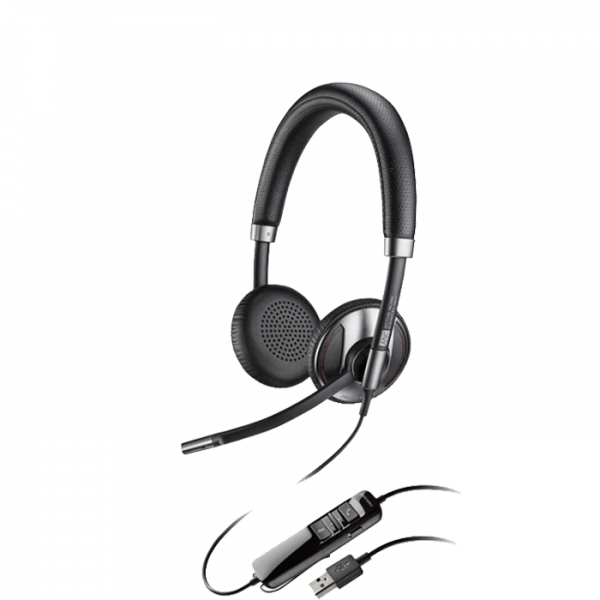 The noise-cancelling mic seems to work well for both purposes, but doesn’t seem any particularly better or worse than other headsets these days – they are all pretty underwhelming in my experience. In case this can be a helpful clarification for some folks, the Active Noise Cancelling (ANC) feature applies only to stuff you hear around you; it doesn’t have anything to do with the noise-calling capability of the mic. That being said, the ANC can be a nice way to filter out office noise around you when things are louder than usual. I gave it 4 stars just because it still seems pricey overall to me, but that being said, Headsets Direct absolutely had the best price I could find for this item, so I appreciate that! This headset has great sound quality and the noise cancelling feature is helpful. The only thing I might change is the boom mic is a little short for me so it doesn’t reach the corner of my mouth but this doesn’t seem to impede the sound quality. Sound is amazing! Microphone is very clear, also.